A manual for the MantaMate will be posted here when the module ships. Q: What is the resolution of the sensors? A: Each of the hexagons and round function buttons sends values from zero to around 210. This can be squished down to 0-127 for MIDI purposes. The sliders are high-resolution, with values from 0-4096. Q: The rubber feet fell off my Manta. How can I replace them? A: 2nd and later edition Mantas come with inset rubber feet. If they fall off, send me an email and I will send replacement feet. Attach them with superglue and they are much more robust. Q: Can I use two Mantas at once on the same computer? A: Yes. If using the Manta Max object, just make two instances of the manta object, and send "connect" messages with serial numbers of the two mantas. Q: Do the sensors sense pressure? A: No, they sense surface area. I find that rolling my finger down over the sensor produces a very even increase in value. Watch this Youtube video for a demonstration. Q: My manta freaks out when I hold down too many sensors. The lights flicker and dim, and then the manta stops responding to anything. What's up? A: This happens on the 1st and 2nd edition Mantas if you use a low-quality USB cable. I've seen this with those cheap digital camera USB cables from China. It means that the current the manta needs (around 370mA) can't be supplied by the cable. The cable I supply with the manta is a high-quality Molex cable. The part number is 88732-8902 for the 2-meter version, and 88732-8602 for the 1-meter version. Those Mantas are picky about the USB cables due to some design mistakes in the power supply routing from the USB connector. I fixed it in the 3rd edition Mantas. The specs are: 5-pin USB cable, A to Mini-B. Q: My manta has scratches and subtle stains on the metal surface. It doesn't look like what I'm used to in a new product. Is this normal? A: Yes, all mantas have scratches and stains from the manufacturing and assembly process. They are all one-of-a-kind. You can use a metal polish on the surface if you'd like to get a more polished look. I've recently started using a metal polish on the circuitboards before I ship them. I really like Cape Cod polish, from this website -- it works well and doesn't smell bad like Noxon or Brasso. Q: The Manta looks amazing. How do I keep it clean? I'm really worried about spilling something on it. A: I've spilled soda on my main manta twice. Both times, after unplugging it from my computer, I cleaned it with Isopropyl alcohol and a soft rag (like an old t-shirt). This works fine. Get the highest percentage isopropyl alcohol you can find - it needs to be at least 90% to not leave residue. You can also use the same alcohol to clean the wood. This is a good practice anyway, if you find it's gotten dirty from your fingers. Q: Is that surface toxic? It looks like lead. A: No, it's perfectly safe. It's copper, plated with tin. The manta is ROHS compliant, and completely lead-free. Q: Why don't you make a manta with a white-tailed deer laser engraved into the back of it, so I can hang it on the wall of my hunting cabin, and then take it down when I'm ready to play a gig? 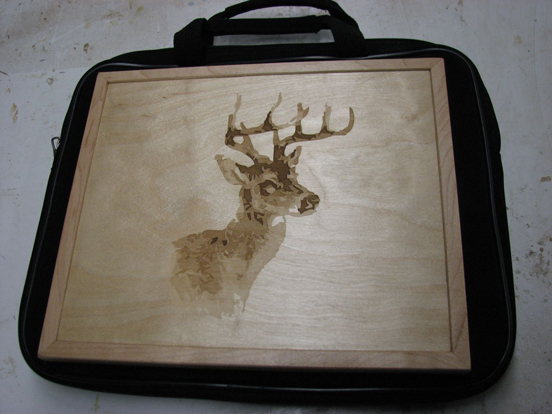 A: What you want is one of the special-edition Northwoods Wildlife Pyrography Mantas. Unfortunately, I only made two and they both sold. Sorry! Q: Can the LEDs be dimmed? A: No. Not with the current hardware. I experimented in early prototypes with LED dimming methods, and couldn't find a way to do it without increasing the noise on the capacitive sensors beyond what was acceptable to me. Q: Why don't you have dual-color LEDs? A: The first edition mantas were only single-color LEDs, but when I was thinking of improvements for the 2nd edition, I found a way to do dual-color LEDs efficiently. The current run of mantas has both red and amber LEDs. When you are not controlling the LEDs from the computer (local LED control mode), only the amber LEDs light. If you send data to the LEDs from the computer, you can light the red LEDs as well. Q: Your development seems pretty slow. You were working on the MantaMate for several years before you released it, and the Birl still isn't out yet. What gives? I want more stuff! A: I have an academic job as the Director of Electronic Music at Princeton University, and the Director of the Princeton Laptop Orchestra, or PLOrk. I also do a lot of electronic music research that produces papers or usable instruments but doesn't take the step to commercial production. This takes up a lot of my time, but I also think that getting new musical instruments into the hands of performers is an extremely important part of this research, so I aim to bring my designs to market whenever possible. Q: I made something cool with the Manta. How can I show it off? A: Post it to the Manta-Users google group or the facebook page! Or put it on Youtube or Vimeo or SoundCloud and tell people about it on some internet forum. Also, email me so I can check it out!